Nearly a year ago, in a show preview much like this one, I plead the case for you to to check out a Streetlight Manifesto show, not just for the band itself, but for what they represented to their respective scene in a larger context, and because of their importance to its continued evolution. Of course, in the time since, Streetlight effectively announced their retirement from touring. I might have been wrong about the vessel, but the sentiment and the need for that space to be filled is still an integral one. That same space exists in other scenes in flux, notably the rise of the new emo movement. To be fair, emo never left, but it has certainly spent the last few years relegated to the basement once more, slowly (and unintentionally) building its way back into the broader musical consciousness. At the Streetlight Manifesto show, Hostage Calm also performed and, at the time, I called them “to pop punk what Streetlight Manifesto are to ska.” I stand by that, and, in new plea for a must-see package I think is infinitely more important than just another show (which is why this will not be just another preview), I’ll explain why Saves the Day are one of the most significant bands on the planet to link emo’s past and present, and why Into It. Over It. are prime candidates to carry that torch going forward. Tomorrow night’s show at Exit/In (for which tickets are selling fast) isn’t just a concert. It’s a snapshot of a moment in musical history; a new wave of bands, and an explosion of a scene primed to get its due once more. Don’t go for the nostalgia of it. You would be doing yourself a disservice. Go for what all three of these artists mean to music today, and tomorrow; that’s why this show is important. Third-wave emo pioneers Saves the Day had already changed the scene irreparably by the time frontman Chris Conely was barely out of high school. Mind you, this was still a time when the “e” word was being thrown around without irony (though not all emo bands chose to classify themselves as such), and long before it entered the pop culture lexicon as a term to describe the gender-bending, faux-goth Hot Topic youth of the early to mid ’00s. Though Blink-182 often gets the lion’s share of the credit (and, to be sure, they earned their massive success), Saves the Day arguably had more specific influence on the pop punk/emo convergence at the turn of the century, and shaped what would become the dominant subculture rock movement of the mid 2000’s. They’ve never stopped, and, in fact, have released some downright impressive records since the early breakout success of classics Through Being Cool and Stay What You Are. Though their real-world popularity never grew to match their reputation or influence (and certainly never ballooned to the crossover success of peers Blink-182 and Jimmy Eat World, two acts which further diverged from emo’s roots), Saves the Day have, in 2013, emerged as perhaps the single-most apt band to bridge the gap of old and new. … but to only allow Saves the Day to fill that musical function, if they’re a band that ever meant a great deal to you, is to do them a disservice (if you’re a new fan, by all means, grasp onto whatever you need for a launching point). There’s a reason emo pops up every few years in a major way, and why its looming forth-wave is suddenly gaining so much traction; it’s an honest, reactionary, relatable contrast to mainstream music culture, whenever said mainstream music balloons to a place of even more disconnect, overindulgence, and artificiality than normal (as it has over the past couple of years, parallel to the decline of mainstream rock and roll). If Saves the Day are a band you still love, and you’ve loved all along, then I’m sure I’m preaching to the choir, but if they’re “that band you loved in high school,” just try to remember why it was that you loved them so much in the first place. You might have grown, and that initial point of connection might not be as emotionally resonant, but the sentiment and its function certainly should be. Remember that, then listen to the track below; the encapsulation of the group’s new, self-titled effort and total return to form. The emo band we’ve needed all along is the one that never left us. Long live Saves the Day. If fourth-wave emo is poised to explode (it is), then no one is better-suited to be the face of it than Chicago’s Into It. Over It., the musical vehicle of Evan Weiss. 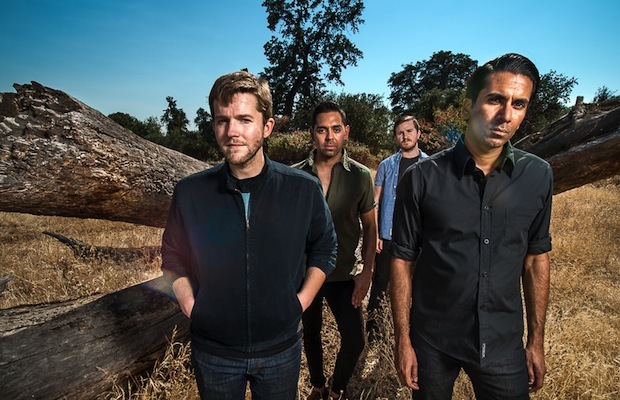 While Saves the Day still sound as fresh and relevant as ever, the group remain wholly a function (and important part of) the scene they helped shape. Weiss, in turn, channels elements of the scene’s past, co-opting its best aesthetics, and repackages them into something entirely new, modern, and progressive – paying homage to what has come before, but not limiting himself to simply being an emo revivalist. Drawing heavily from his midwestern roots (Cap’n Jazz, Braid, and The Promise Ring would be proud), Evan even shares a side project, Their/They’re/There, with emo forefather Mike Kinsella. Even-handedly channeling math rock, indie rock, and pop punk influences, Into It. Over It.’s latest effort, Intersections is above and beyond anything the band have previously released. Weiss juxtaposes heartfelt, melodic sentiments with unconventional time signatures, rhythmic choices, and textural palettes, often bordering on tastefully abrasive. While the “return of emo” discussion at large will continue until the scene smacks the music press in the face, the recognition from sources like SPIN, Pitchfork, and The A.V. Club (and contonued support from the likes of Alternative Press and AbsolutePunk) that IIOI have been recently receiving, further reinforce what I wholeheartedly believe: emo is back, and will re-enter the broader musical consciousness in a major way throughout 2014, and Evan Weiss is the most likely (and most fully deserving) candidate to be at the forefront of the discussion. Landing more on the punk (specifically pop punk) spectrum than the bands they’re on tour to support, Hostage Calm are a major player in the course-correction that has been rippling through the pop punk scene, since its mainstream radio viability all but dropped off over the past few years. Pop punk, as a genre, was mostly co-opted in the late ’00s by pop bands making radio grabs by riding the stylistic coattails of artists like Blink-182, Green Day, and Fall Out Boy. In doing so, what shred of “punk” the genre was still clinging to was watered down. Hostage Calm bear little stylistic resemblance to any of those bands, so much as the scene they sprang from. Taking a cue from peers like The Gaslight Anthem, Hostage Clam have infused a great deal of earnest, Springsteen-eque heartland rock into their sound (although in much greater moderation than Gaslight), along with genuine, organic, melodic sensibilities (this is a band very much grounded in punk, but totally unafraid to let their pop side run wild when it’s appropriate). On last year’s Please Remain Calm, the group fully realized the sound they spent several years shaping. Starting with a true punk rock backbone and attitude (the record reflects the bleakness and defeat of youth culture during a period of American decline), the fantastic effort blends elements of pop and rock to produce a refreshing and refined re-imagining of a genre that has largely lost its footing. Like Into It. Over It. with emo, the future of pop punk lies with bands like Hostage Calm- willing to distill a stylistic movement to its essence and continue its legacy for a sincere love of the genre, and the movement that surrounds it. Hopefully a new generation of pop punk, real pop punk, will arise as a reaction, as it has with emo, and continue to push the style forward in a direction fans can be proud of. Saves the Day, Into It. Over It., and Hostage Clam will perform tomorrow, Oct. 6, at Exit/In. The show is 18+, begins at at 8:30 p.m. (doors at 8 p.m.), and tickets are available for $15 in advance, or $18 the day of the show.